Despite of all casinos' security, sophisticated surveillance systems and specialists, some players who believe that bending some rules is a part of some certain casino game, still find unfair methods of how to beat the house. This is the most popular casino cheating method of beating the dealer in blackjack. 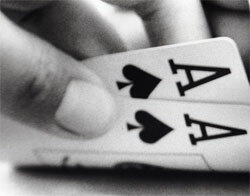 Card counting has a rich history. The inventor of this casino cheating technique is Edward Thorp, mathematics professor of Massachusetts Institute of Technology. Thorp in his book "Beat the Dealer" explains all aspect of card counting. Later this book would make many US casinos to change blackjack rules as, in fact, card counting is legal. And of course, famous MIT Team, a group of students which took Thorp's book as a basis for their card counting strategies for playing and winning huge sums of money in Vegas and Atlantic City casinos. There was a group of roulette players in the past that created microcomputers with the help of which they were able to influence the roulette ball during the game. They hid these computers in their shoes and pushed it with their legs and activated the device which made the ball fall on some certain pocket in the roulette wheel. There are two basic methods to cheat a casino on the internet. Some players used to register several accounts on one casino site and play one game from all that accounts. It increases the winning odds greatly. And the second method consists in working several online casino payers as a team. Two or more players can consult with each other with the help of their cell phones or some internet messenger programs when playing and then split the winning. It is up to you to decide whether to use such methods for winning casino games or not, but every player should remember that it is very risky to cheat a casino, especially land based. Every casino has its advantage over the players and they are doing everything possible to prevent methods which can change this fact.